The Nyeleti 2:3 Young Male peers across the plains from his perch on a koppie. It seems that all three of the relaxed youngsters are setting up their territories on Marthly, which makes us very happy! 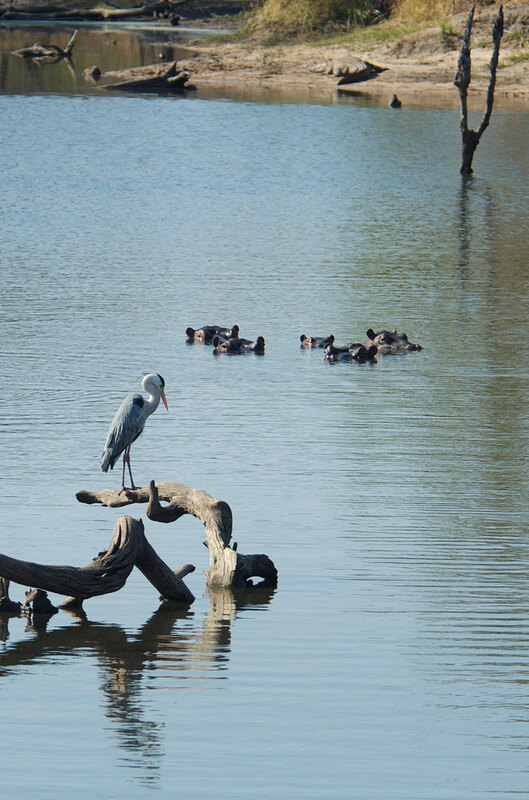 A typical scene at Ronnie's Dam, a grey heron searches for fish while the hippos and crocs look on. 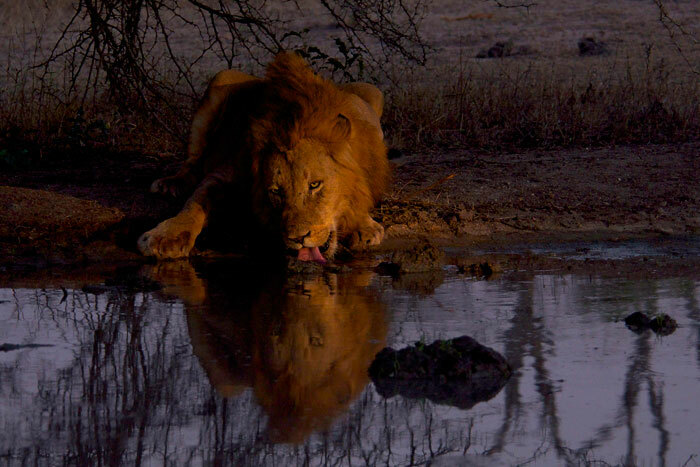 One of the Majingalane Males drinks during sunset. This Coalition could be heard roaring throughout the evening every night this week. Three of them even walked through the camps late one night! 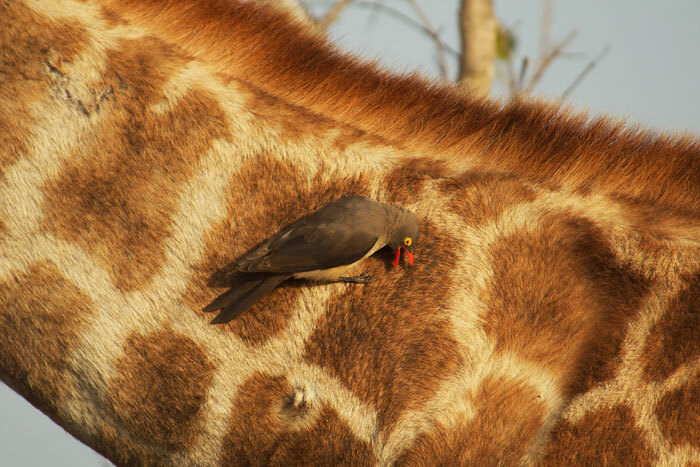 A Red-billed oxpecker combs through the fur of a young giraffe, looking for ticks. 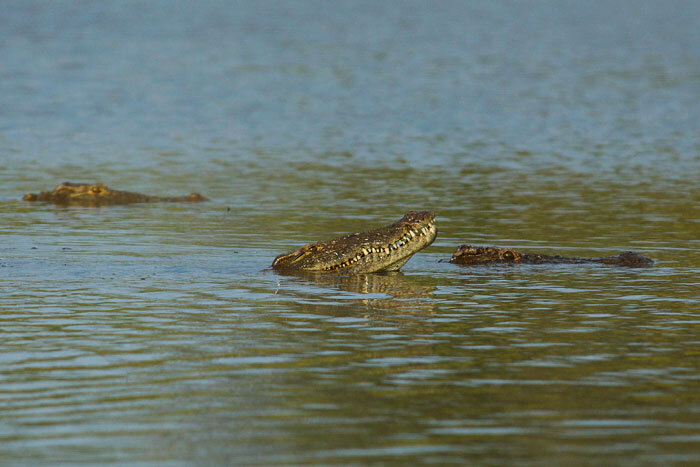 Crocodiles can be elusive; after all, they are ambush predators well-camouflaged in the water. This sighting of 3 crocodiles together was very interesting as they appeared to be displaying to one another, perhaps a pre-mating ritual. 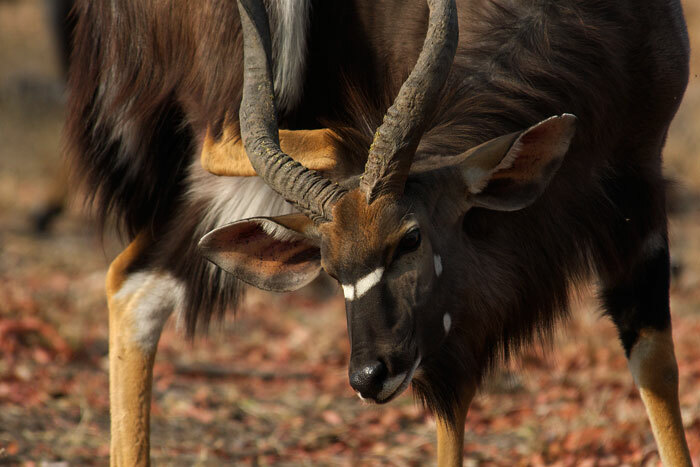 A male nyala pauses while foraging for Jackalberry fruits to scratch himself. 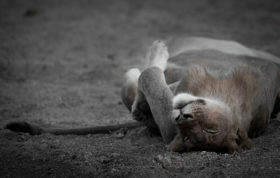 The Nyeleti 4:3 Young Male looks up at an impala kill in the tree next to him. When we found this leopard he was sleeping at the base of the tree with the kill hoisted, but neither full nor content: he was very nervous of his surroundings and kept jumping up at the slightest sound. 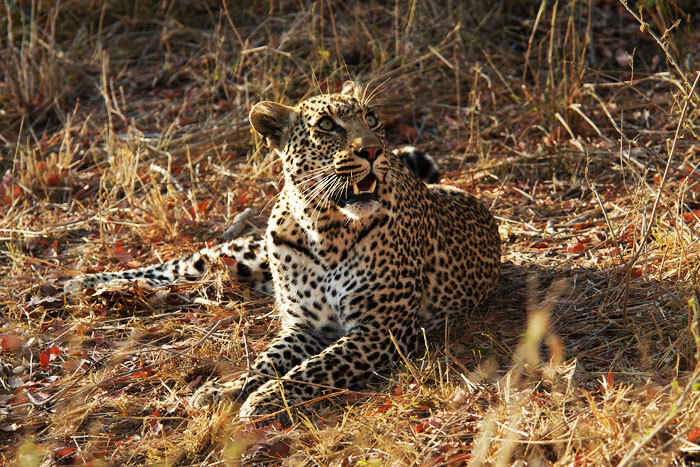 We figured there must be another leopard in the vicinity. Soon after, he climbed the tree to feed on the carcass. Meanwhile, however, the Vomba 3:2 Female appeared beneath. They growled at one another, but he continued to feed, clearly the more dominant animal in this situation, despite Vomba's seniority in age! 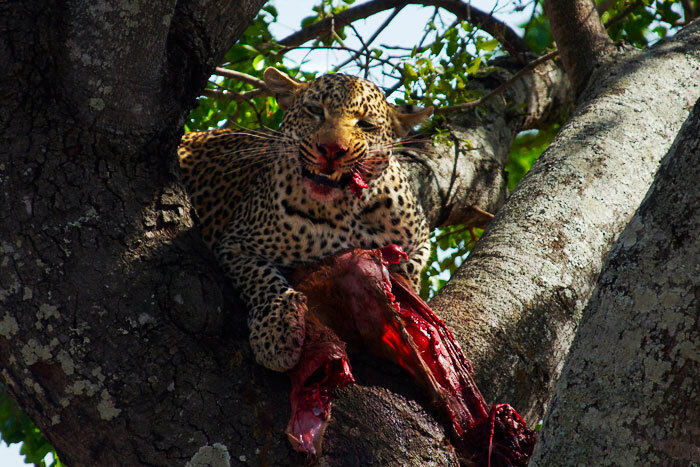 The two animals are unrelated, and because this happened within Vomba's territory, we think perhaps she had done the hard work and he stole the kill from her. 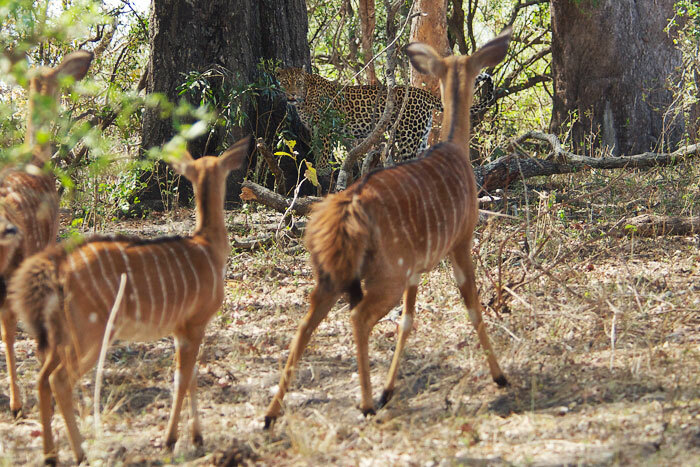 Clearly irritated by the situation, the Vomba 3:2 Female moved off, walking straight through a group of nyala while rasping. 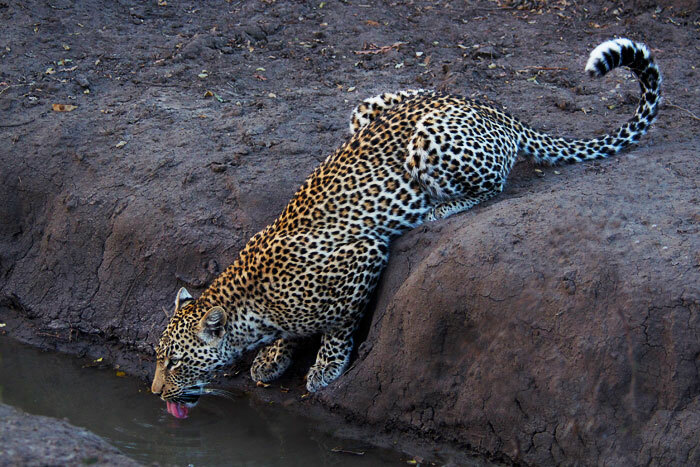 The Vomba 3:2 Female then went to drink at the Sand River, and moved off into the reeds. Hopefully she was able to secure another kill without getting it stolen by anyone else! 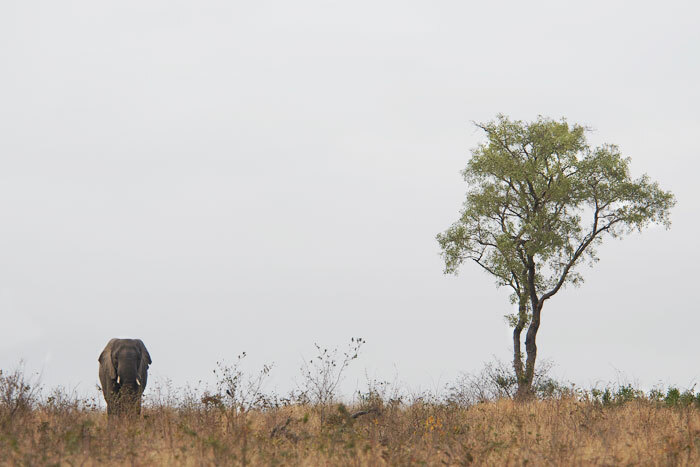 A bull elephant grazes peacefully in the final light of day. 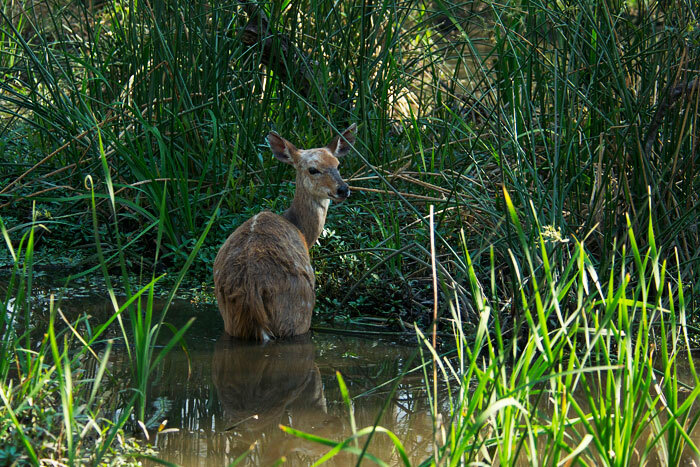 The water in Camp Donga is a rather strange place to find a bushbuck! This ewe was not stuck in the mud, as we thought at first, but rather feeding on the apparently tasty aquatic vegetation. Interesting choice - but she must be doing something right, as this ewe was extremely old! 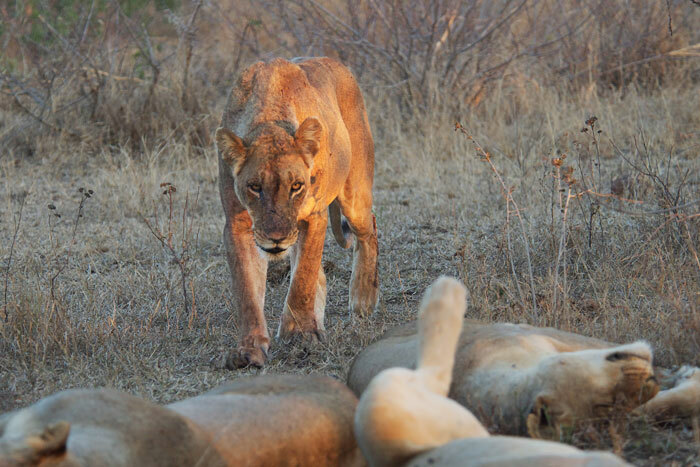 The oldest Sparta lioness walks towards the other four pride members. They had made a kill earlier in the day which was stolen by the Majingalane Coalition, and judging by the red colour of this lioness, she was probably the most involved in the action. 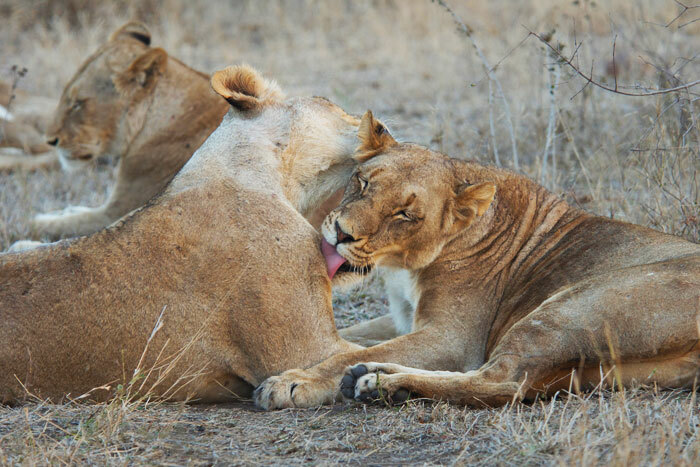 Two of the younger Sparta lionesses groom one another. 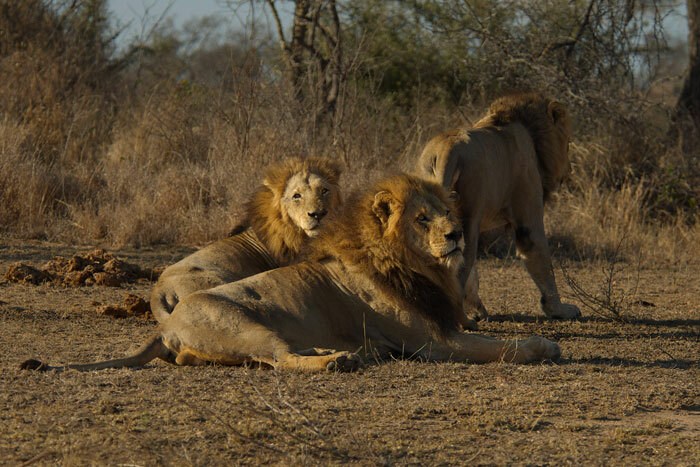 The Sparta Pride spent most of the week on Londolozi, along with all four of the Majingalanes, although the males as usual were spread out over the reserve. 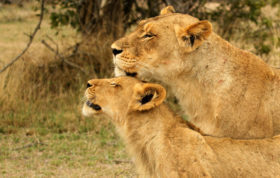 This pride is looking more and more healthy by the day, and we noted that two of the lionesses appear to be lactating. 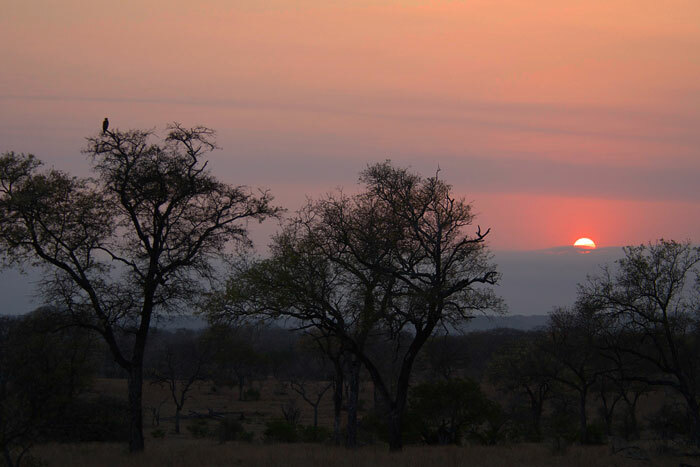 A Tawny Eagle watches the sun rise on Marthly. 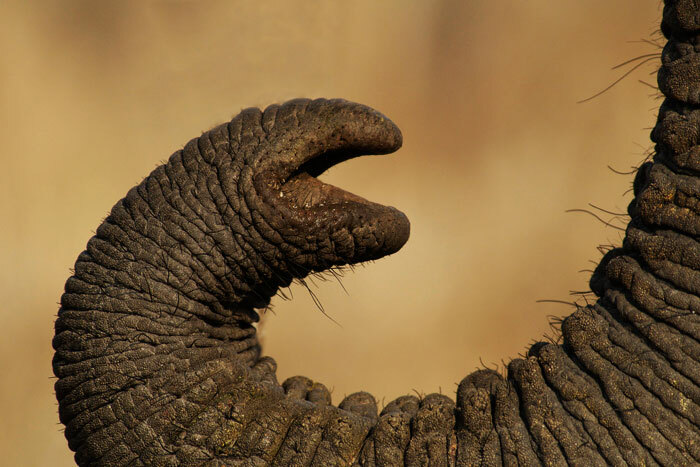 An elephant gives us a close-up of his trunk, which with its many synapses and helical muscle fibres, is an unbelievably complex appendage. 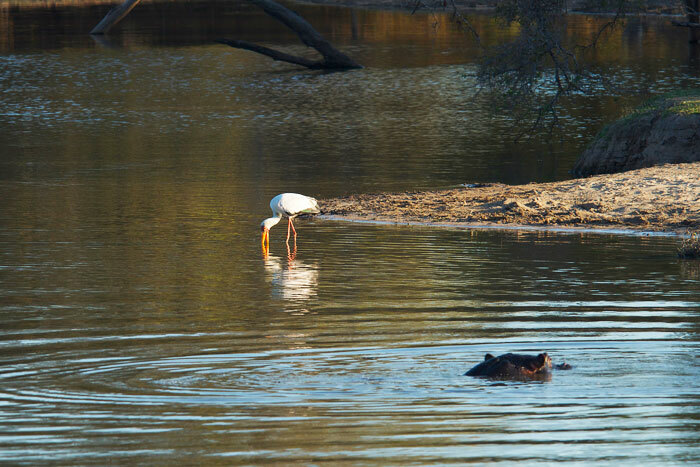 A hippo checks out the new visitor to Taylor's Dam: a Yellow-billed Stork. 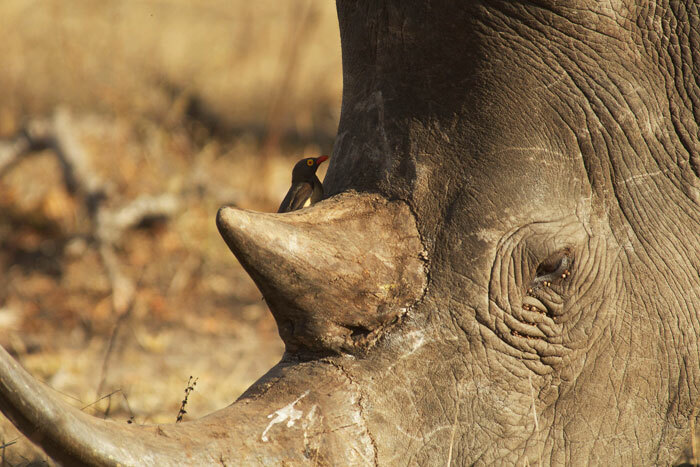 An oxpecker sits on the face of a White rhino. Up close, one can see why the birds target the soft skin around the eyes and mouth: it is quite often full of ticks. It was World Rhino Day this week, and we continue along with these peaceful animals on the fight against poaching. 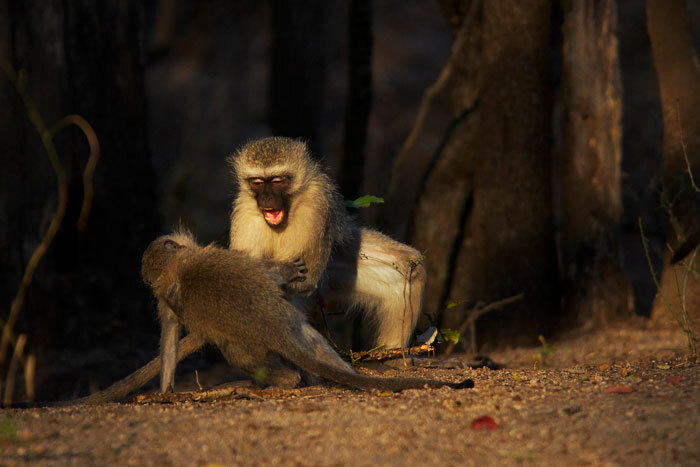 Two vervet monkeys play in a Tamboti thicket. 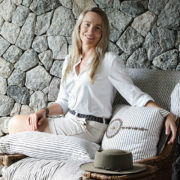 Their human-like facial expressions and behaviours can provide endless hours of entertainment for guests relaxing in camp. 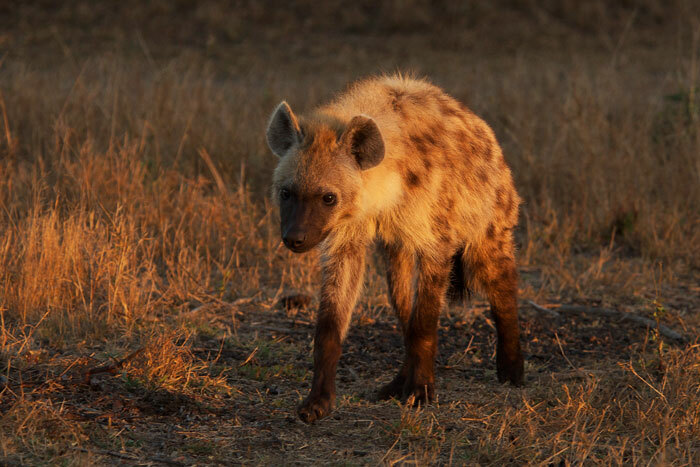 A young hyena heads back to the den site at sunrise, after a night of foraging. 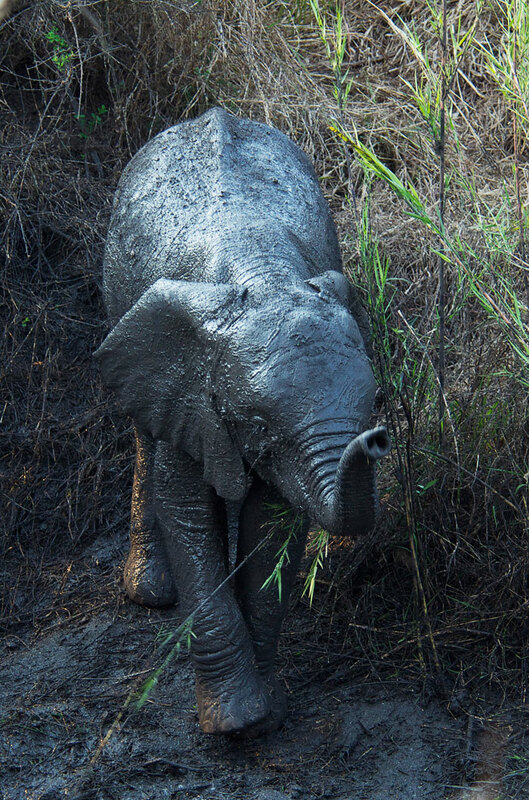 A young elephant plays in the mud on a hot day in the Manyeleti Riverbed. The Mapogo Coalition made an appearance on Sparta this week. These impressive lions appeared to be chasing after a younger pride, but as the day got warmer they lost interest in hunting them down. 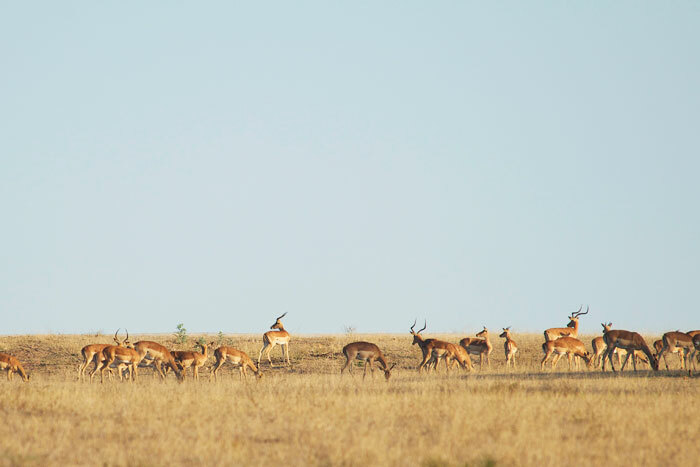 A group of impala line the horizon on a Londolozi afternoon. 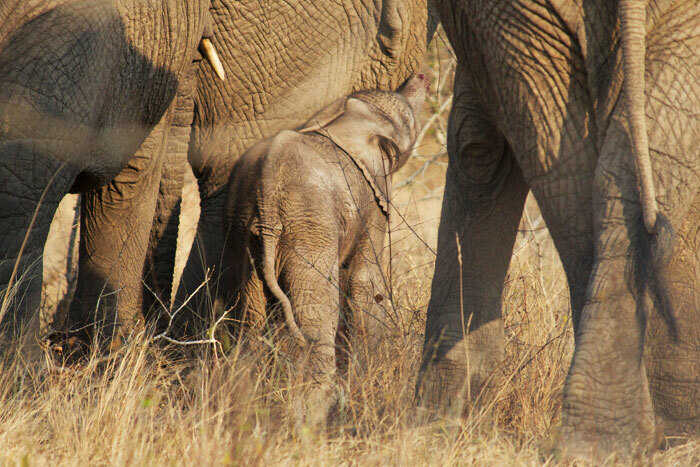 One of the best sightings this week was of a newborn elephant. When we came across this breeding herd, the cows were all surrounding a tiny baby, and the afterbirth lay nearby, a clear sign that it was only hours old. You can even see the remnants of blood on its trunk. 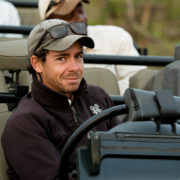 Despite keeping the youngster in the middle of the group, they were remarkably relaxed at our presence on his birthday. 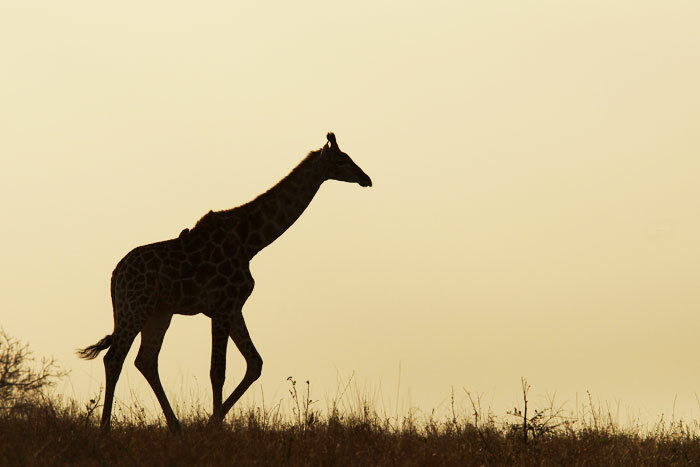 A giraffe meanders across Warrens Crest at sunset. 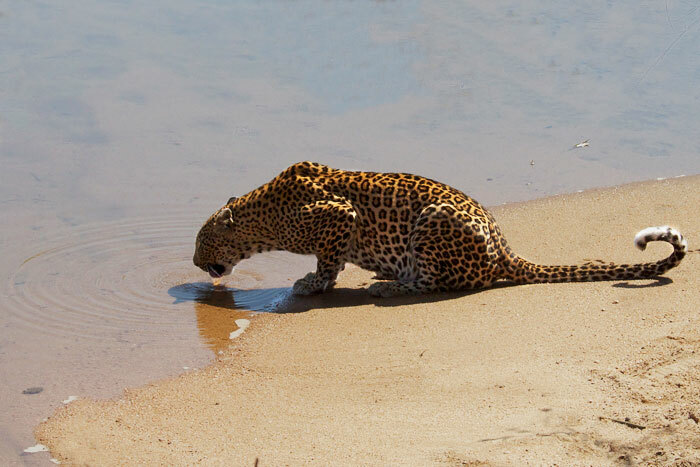 The Nyeleti Young Female drinks near Nyeleti Pan. 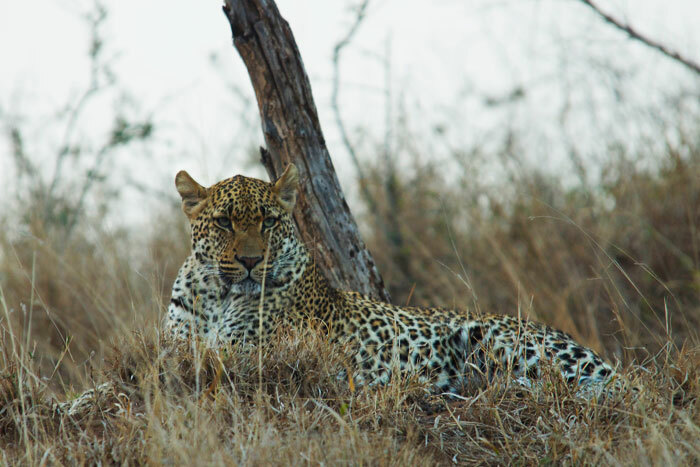 She scent-marked often while she hunted in the area, a sign that this beautiful leopard is setting up territory in the area her mother previously held. I have to point out that she was tracked and located by my brother, whose 'day job' is usually behind a desk in London! Wow, what a fabulous selection of nature’s glorious beasts, and as always amazing photography. 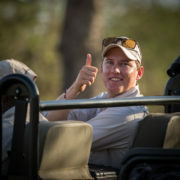 Do congratulate your brother on his tracking skills – your wonderful photos will, as for all of us, launch him back to Londolozi when he finds himself once again behind that desk. Have a great weekend Talley …. Truly beautiful pictures Talley. Looks like you had an exciting week. good for Tracker Price! An exciting week for the Bermudians and another spectacular week of photos. Thanks Talley! Miss you all! Thanks Janie! We miss you!! Talley,beautiful pictures again! I enjoy your photography very much. As I said…I check the blog almost daily—and it was worth today’s visit to see the latest. You know I particularly liked the elephant with the tree. Your artistic eye makes me go wow every time. Had another family gathering with Judy & Mike last night so we could share our pictures and memories. Did Shayne and everyone LOVE the pictures and stories?? Hopefully you’ll ALL come back together sometime 🙂 It makes me so happy that you check the blog every day… thanks a million! Oh Happy Birthday little Jumbo! The elephant is my alma mater’s mascot and I must say he is absolutely adorable! Thank you for sharing!! 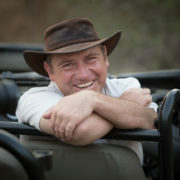 Hi Geri, it was incredible to witness the first moments of the life of such a majestic animal, I must admit!! 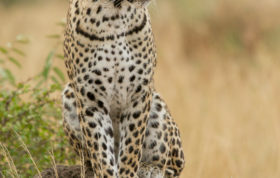 Price tracking leopards!! Awesome…terrific stuff, Talley. Those lions sure are fearsome critters. p.s. – loved the video on Facebook!! Incredible wasn’t it!! And yes, Price has a new occupation at hand! I love the shout out to Price in the last picture!